1. BE CLOSE. Start with Matches shown as 4th Cousin or better. 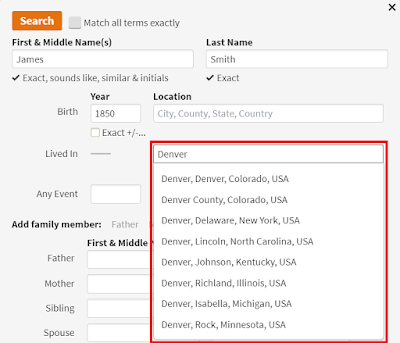 After you've exhausted those, you can attempt 5th Cousin Matches (I've confirmed at least one family line with a Match listed as a 5th Cousin, but the connection generally gets more difficult to find and prove when you're dealing with more distant relationships). Given that I have over 1,000 Matches on DNA Relatives I can narrow the list down to 124 who are listed as "3rd to 6th Cousins" or better in their Relationship range. 2. BE INTERESTED. Know that people on Family Tree DNA's Family Finder site are typically more universally interested in genealogy that those on 23andMe's DNA Relatives site (this is mainly due to the fact that many people use 23andMe for health purposes and the DNA Relatives test may have just come along with their purchased package). But I've actually had better results with the DNA Relatives Matches so far. Why is that? I only make contact with Matches who list a decent number of surnames in their 23andMe profile. It stands to reason that if someone has no or very few surnames listed in their profile, they 1) likely aren't very interested in genealogy, 2) haven't had much success finding their ancestors, or 3) in some other way may not be too helpful in the mutual quest for ancestors. 3. BE SIMILAR. Of the list of Matches you've narrowed down so far, look for people who have one or more matching surnames to surnames you know are in any of your direct bloodlines in the last five or six generations. Make contact with the Match, and in the case of 23andMe, be sure to share genomes at the basic level. In Family Tree DNA's Family Finder, go to Chromosome Browser, click the name of the Match you're working on, then click the View this data in a table link on the right side of the page. In that table, I tend to just look at Chromosomes with a matching length of around 10 or more CentiMorgans AND a 1,000 or more Matching SNP's. There's no perfect number; you just want the "larger" numbers. See example screen below of a row I would choose for this Match. Hold tight, and I'll tell you what to do with this. In 23andMe, go to My Results, Ancestry Tools, then Family Inheritance: Advanced. Choose the name of the Match you're working on, then click the View in a table link. It only shows you the longer-matching segments, so you already have the data you need for the next step. See example screen below. Now you're ready to triangulate! To do this, I simply built a spreadsheet with the columns of data found in the tables above, plus a few others to help me keep track of my Matches. See the screen shot of my spreadsheet below (with the names of my Matches partially hidden to preserve their privacy). Click the image below for a larger version. I'll explain the additional columns at right, and how I use them. I added a Surnames in Common column at the far right to list surnames that the Matching person and I both stated were in our direct bloodlines in the most recent dozen or so generations. I also added a Speculative MRCAs column and Confirmed MRCAs column to type in the name of the Most Recent Common Ancestor that my Match and I share. I use the Speculative MRCAs column when my Match or I haven't found strong enough genealogical evidence to prove the link, and the Confirmed MRCAs column when we both already have strong documented evidence of which most recent ancestral couple we both relate back to. Quite cool indeed, as this not only solidified and expanded the genealogy for that line of our families, but I've also met several new genealogy cousins who have been great to correspond with. Well, this post grew to be a bit longer than I had envisioned. Sorry about that; but I hope it is useful in highlighting a few ideas that perhaps you haven't tried yet. Feel free to add comments and suggestions for everyone's benefit below. p.s. For another way I've used DNA testing -- this time Family Tree DNA's yDNA test -- read this article: Unexpected Name-Change Brick Wall Busted! Great post! I will have to try this. Very interesting. This lays out a clear and systematic process for us to follow. Many thanks. Now can you suggest how adoptees might use 23andMe and FTDNA data!! The number and proximity of your matches is probably better than average. I have about 30 FF matches on FTDNA. The closest is a predicted 3rd cousin, a few are predicted 4th or greater, and the rest 5th or greater. My dad has 178 matches on 23andMe, none closer than predicted 4th cousins. I know of many people with less FF matches than me, and at least one person with no FF matches at all. If you want a way to download the Chromosome data all at once, check out http://www.dnagedcom.com. It allows you to download your Family Finder Chromosome map at once instead of 5 at a time. Also, it downloads all your data for 23andMe for Family Inheritance Advanced, Relative Finder and Ancestry Finder. Much faster than trying to do it all individually. There was a website called gedmatch.com that you could upload the raw data from both Family Finder and 23andMe. You could then upload your gedcom file and it would compare names/places/dates with someone elses gedcom file. It sounds like this does the "Step 4. Triangulate" for you.